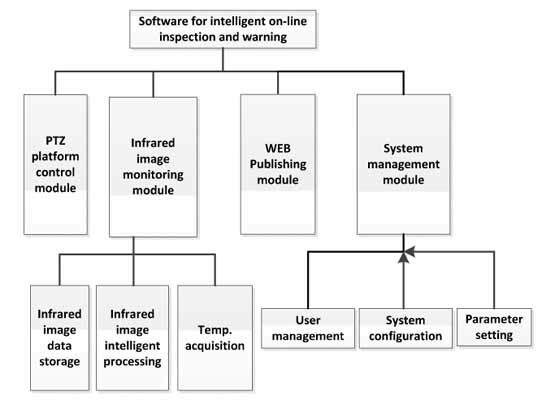 This paper presents an on-line inspection and warning system based on infrared image to detect the thermal fault of transformer bushings in the early stage. The network infrared thermal imager combined with the omnidirectional PTZ platform is the key device for the surveillance task. BRISK (Binary Robust Invariant Scalable Keypoints) algorithm is applied for the automatic object recognition and localization. In addition, the software based on B/S architecture is designed and realized for remote data transmission, so the remote users can acquire the real-time information through the private network. This system realizes the remote, real-time online monitoring and analyzing of transformer bushings, the comparison results validate the accuracy and efficiency of the recognition method, and the evaluations of the measured data verify the practicability of the system in the 110kV substation. BRISK, infrared image, object recognition, on-line monitoring, transformer bushing. School of Electrical and Electronic Engineering, North China Electric Power University, Baoding, China.